An Unsecured Promissory Note is a document that details the borrowing of money from one individual or entity to another without security if the debt is not paid in full. Unlike a secured promissory note, the lender is taking into account the borrower’s credibility without receiving anything in return if they shall default on their payments. Typically, payment is structured on a weekly or monthly basis with installments made by specific dates and without pre-payment penalties. Secured Promissory Note – Requires the Borrower to place assets or property in the Note which is only given to the Lender in the event of non-payment. What is an Unsecured Promissory Note? An unsecured promissory note is a simple agreement form that accompanies a loan. It is sometimes referred to as a bank note by individual lenders. 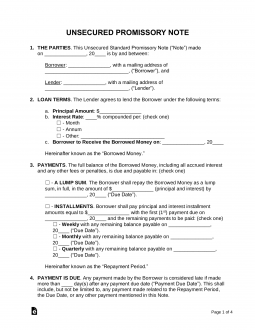 The purpose of this document is to outline how the borrower (the person receiving money from a bank or another lender) promises to pay back the money. Any terms for late payments/fees, what happens when the loan defaults, etc. Of course, both parties and any witnesses will sign the promissory note. Then it will be notarized by the proper local, county, or state officials. In essence, the promissory note is just a signed statement documenting the transaction of a loan and the borrower’s intent that they will pay back the loan. Unsecured Promissory Note VS. Secured Promissory Note? Whether you are a lender or a borrower of a loan, it’s important to understand the difference between what makes a promissory note secured versus unsecured. They often look identical and include most of the same things you would expect from a promissory note. However, there is one big difference between the two. An unsecured promissory note is only a document stating that the borrower “promises” to pay back the amount due. There is no collateral or other form or security for the lender if the borrower were to default on the loan. A Secured Promissory Note does have collateral in place in case the borrower can’t pay back the loan. Collateral can be a house, a car, financial accounts, or other equitable assets. Whatever the collateral may be, the secured promissory note lists what it is and states that the lender can collect the specified assets when the loan goes into default. This provides a degree of assurance to the lender to protect their own interests and investments. This is especially the case with big lenders such as banks and credit unions. When Do I Need an Unsecured Promissory Note? Often, lenders and borrowers will use a secured promissory note rather than an unsecured promissory note. This is because of the additional protections that the secured promissory note offers. Lenders will know going before signing a loan that the borrower will be able to pay it one way or another. However, there are instances where such protections would be unnecessary or hard to implement. One typical example would be student loans. Most traditional college students don’t have the collateral necessary to cover such an enormous expense, but lenders are still handing out loans expecting these students to pay them back. An unsecured promissory note would be used to have the student (and possible cosigner) state in writing that they intend to pay back the loan. Can I Enforce an Unsecured Promissory Note? Though an unsecured promissory note doesn’t have collateral attached to it, a lender can still collect from a defaulting borrower. You can send a demand for repayment to the borrower, file a suit in court, or enlist the help of a collection agency. An unsecured promissory note is still a legally-binding document after all. The risk is that even if your party takes these measures to collect payment, it often comes with additional fees that may cut into your investment. And even if you take these routes, there are no guarantees that the borrower can pay back the loan in full. So you might suffer a loss. It’s important to be sure before signing an unsecured promissory note that the lender is willing to take the risk and that the borrower is capable of paying back the loan. When everything is prepared properly, an unsecured promissory note can make the loan filing process quick and efficient.